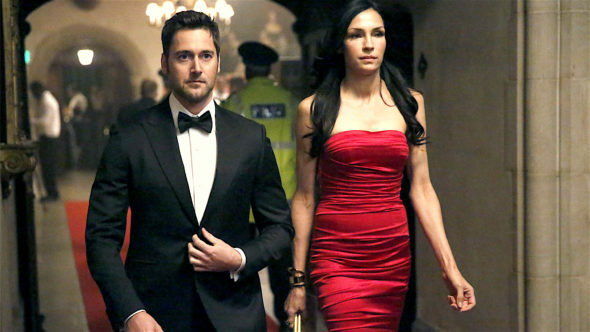 Performers include: Ryan Eggold, Famke Janssen, Edi Gathegi, Tawny Cypress, Adrian Martinez, and Terry O’Quinn. A crime drama action thriller and spin-off of The Blacklist, The Blacklist: Redemption TV show features the slipperiest offenders from Red’s (James Spader) notorious list. They are now an exclusive unit of mercenaries, working together to atone for all the harm they once unleashed upon the world. Howard Hargrave (Terry O’Quinn) founded Halcyon Aegis. Now his son, Blacklist undercover operative Thomas “Tom” Keen (Ryan Eggold), has joined Halcyon Aegis’ Grey Matters branch. The brilliant Susan “Scottie” Hargrave (Famke Janssen) leads Grey Matters. In addition to working with her, Tom must team with his adversary, assassin Matias Solomon (Edi Gathegi). The group also includes the mercenary Nez Rowan (Tawny Cypress) as well as cyber hacker Dumont (Adrian Martinez). Now, they’re doing bad, for good. As they set out to redeem themselves for their past sins, the new team tackles seemingly insurmountable predicaments that even governments won’t. Will their new, daring missions help these tortured creatures save their souls? First aired: April 13, 2017. What do you think? Do you like The Blacklist: Redemption TV show? Do you think it should have been cancelled or renewed for a second season? I just found this show, really enjoyed it and wish it had not been canceled. The flippant approach to sexual encounters was a bit tough to assimilate but the rest was interesting. This was a great show to watch. What possesses network people to end incredibly good shows. Yes I would have watched a second season. Also the actors were super. After establishing them and people want more you cancel? Not cool and not good business. So now go spend money developing a loser. Agreed. They create a good show and cancel it, then let crappy shows run season after season. Make not sense unless…unless they are attempting to get us to watch LESS T.V. it would make sense then. I can not believe the stupid network cancelled this show !! It was excellent in acting and writing, Hot Hot Hot ! !